This month, we have original science fiction by A. Merc Rustad ("Tomorrow When We See the Sun") and Aidan Doyle ("Beneath the Silent Stars"), along with SF reprints by Hugh Howey ("Beacon 23: Little Noises") and Charlie Jane Anders ("The Time Travel Club"). Plus, we have original fantasy by Rachel Swirsky ("Tea Time") and the late Jay Lake ("Ex Libris Noctis"), and fantasy reprints by Richard Parks ("The Queen's Reason") and Mark Rigney ("Portfolio"). All that, and of course we also have our usual assortment of author and artist spotlights, along with an interview with THE MARTIAN author Andy Weir, and the latest installation of our book review column. 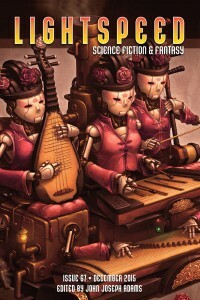 For our ebook readers, we also have a reprint of the novella "The Surfer" by Kelly Link, and a novel excerpt from A DAUGHTER OF NO NATION by A.M. Dellamonica.